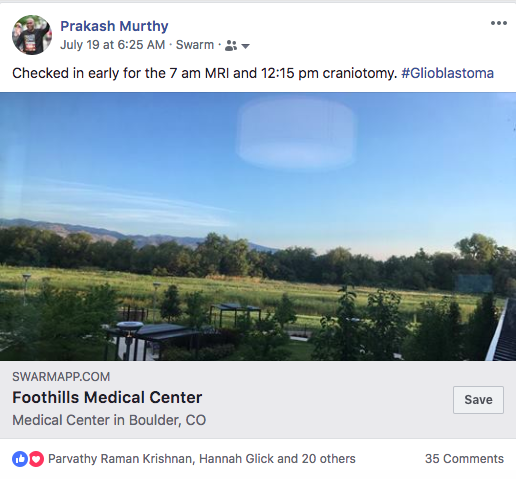 Tomorrow Thursday, July 19, 2018, I have my second craniotomy scheduled at 12:15 pm to address the tumor recurrence discovered nearly a month ago. 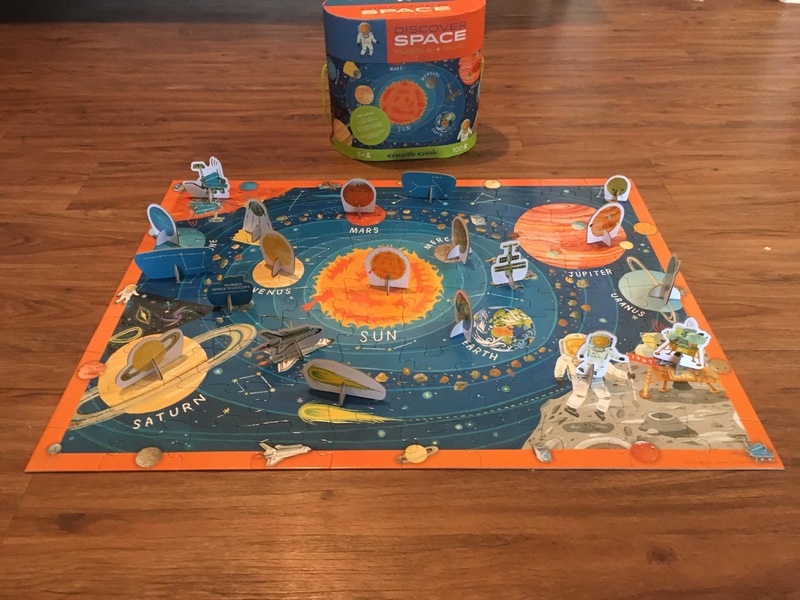 One of my college friends visited us yesterday at home while he was in Denver on a business trip and gifted a 100-pieces Discover Space puzzle set to my 4-year-old daughter. This evening, after my daughter got back home from daycare, all three of us - me & my daughter all the time, and my wife part of the time - spent more than an hour to solve the puzzle. We had a lot of fun all the way while playing with it. Radical Remission: Surviving Cancer Against All Odds book by Kelly A Turner, Ph.D. is one of the few books I found very useful and inspiring in my efforts at learning about and dealing with Cancer. I purchased the book at the beginning of this year and have been reading and referring to it often since then. The lessons from the book have contributed significantly to the small and big changes I made in my diet and lifestyle to defeat cancer. And taking on Marathoning in a serious way as a way towards cancer remission. If I had learned all that I could learn from the book and adapted all the changes suggested, why did the Tumor still come back? Did I not do enough of what was suggested in the book? Was there anything more I could have learned from the book that would have made a difference? I went through each of the Nine Key Factors in a detailed manner, examining each factor against the questions I listed above. To my utter surprise and a little relief, I came to the conclusion that I had missed a few lessons on a couple of key factors, and that I have more work to do on these lines. Here is my elaboration of the lessons I have learned from each of the key factors listed in the book. I have been a vegetarian and a healthy eater all my life. So radically changing my diet to an anticancer focussed one was an easy task. I have cut sugars and refined grains completely from my diet. While I haven't gone full keto - with carbs still being part of my diet occasionally - I think my diet does qualify as near-keto most of the time. I think I have been doing good on this aspect. I have not been depending only on what the doctors prescribe for my treatment. I have been working hard at figuring out what I could be doing as a layman to accomplish cancer remission. I have taken on this task as an ongoing life-long task that could quite possibly increase the chances that I survive this terminal cancer. Doing good on this aspect as well by not being rigid or feeling compelled by others about the treatments. Trying out various options coming up my way. Taking on what works for me. Ignoring what doesn't. So far, I have added Chopped Raw Garlic, Curcumin, Moringa Powder, and Green Tea as natural supplements to my daily diet. Evaluating any new natural or over-the-counter medical supplements as I come across them. This key factor came up as an important one during this round of reading the book. The chapter did help me identify and release suppressed emotions related to two topics while I read through the book in recent weeks. The first suppressed emotions topic is the I am not good enough mental barrier that I have been afflicted since I have been a young kid. This mental barrier has been showing up as I am not good enough to earn enough money every month to make ends meet over the last few years through my career as a freelance Ruby on Rails Developer. Reflecting on my emotional state over the last couple of years, it is very obvious to me that this topic has caused severe emotional angst for me on an ongoing basis, and has quite possibly contributed significantly to my current ill-health. The incredibly generous response to the fundraiser I started recently has taken the bite out of this anxiety and has helped me release the negative emotions I have been harboring for life about my self-worth. The sense of financial freedom promoted by the success of the fundraiser has also given me a good sense of how I can make a permanent dent in my ongoing financial worries. I am currently in discussion for a very promising full-time job as a Ruby on Rails Developer at a well-established company. I hope I will be able to get either this specific job or something similar soon to have a sense of ongoing financial stability. The second suppressed emotions topic is the acrimonious marriage my wife and I share despite having no real reasons for the ongoing attritional battles. While I have been blaming my wife for all of the arguments we have been having over the years, a little bit of honesty and reflection this time showed that I am at the root of all the strife by holding on to too many complaints over the years. Ever since we got married, I have always looked upon my wife as someone not equal to me for various reasons. I have seen more of the world than her. I have better communication skills. I know more about how to deal with life, etc. So on and on. I have been using all this to constantly put her down and build a list of things of where she falls short. With me constantly engaged in this kind of list-keeping, it is no wonder our marriage doesn't have the warmth of true intimacy, and things keep blowing up on a regular basis between us. Realizing the subversive role I was playing in our marriage is a huge eye-opener for me. It has allowed me to let go of the various resentments I have been holding on to against my wife, and work towards building true intimacy into our marriage. A lot of work pending on this item. I have been doing good on increasing positive emotions previously. 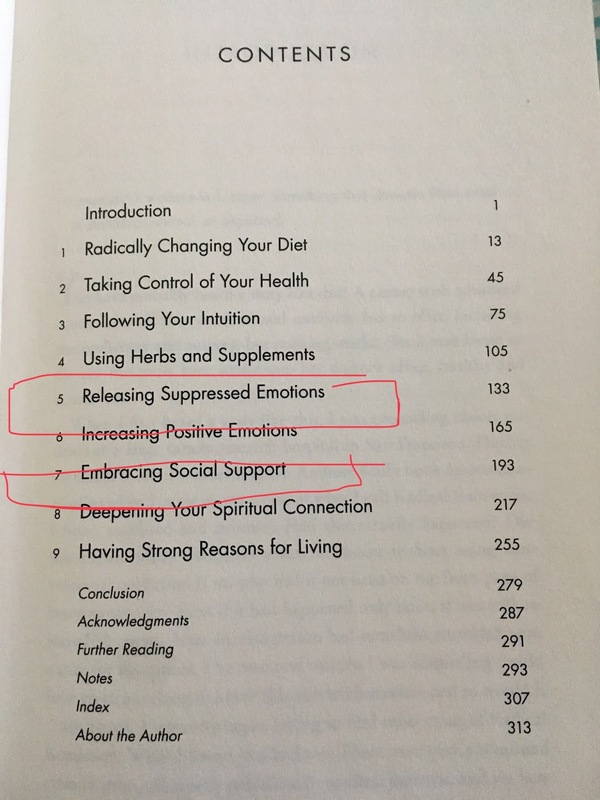 Now that I have worked on releasing some of the negative suppressed emotions, I am sure constantly being awash in positive emotions would be an easy task in the future. And that would radically increase my chances of having a cancer remission. I have from the very beginning been very big on embracing social support in my battle with cancer. I have been very open about it from the original craniotomy and diagnosis. And have been posting updates regularly on social media. As well as in personal one on one conversations. The positive and encouraging comments from many folks have sustained my spirits and motivation over the hard struggle with cancer so far. The generous response to the fundraiser has further emphasized the huge network of social support my family and I have in this battle with cancer. Thanks, everyone for being there for us in our time of struggle! This is a task that has a lot of room for improvement because I have not been doing anything here. I have never been a spiritual or religious person. I have always seen myself as the practical, get-it-done kind of person who doesn't believe in the spiritual and religious mumbo-jumbo. 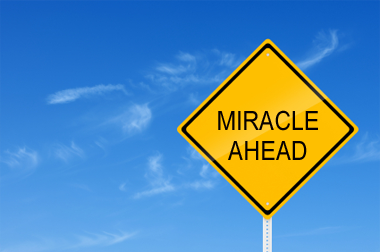 I am getting convinced of the benefits of mindfulness and being in touch with a higher power on a regular basis. I will work towards learning more about the techniques and power of meditation, prayer, faith, and spirituality and hope to deepen my spiritual connection strong enough to lead me to cancer remission soon. Some work required here as well. While I do have a strong enjoyment and preference for being alive and living fully while alive, there have been times in the past where I have wondered if living is all that it is made out to be and if it was indeed worth living. The chapter explains this topic is wrapped tightly around the purpose of one's life. A purpose in life is something I seem to not have a firm handle on all the time. So more work needed here. An overall idea that came to me - way beyond the specifics of the nine key factors - is that I have been going through this battle mostly as a lone-ranger. I have even excluded my wife - my life partner and my primary caregiver - from most of these efforts. I think it would be hugely beneficial to make this a group effort by building a team. 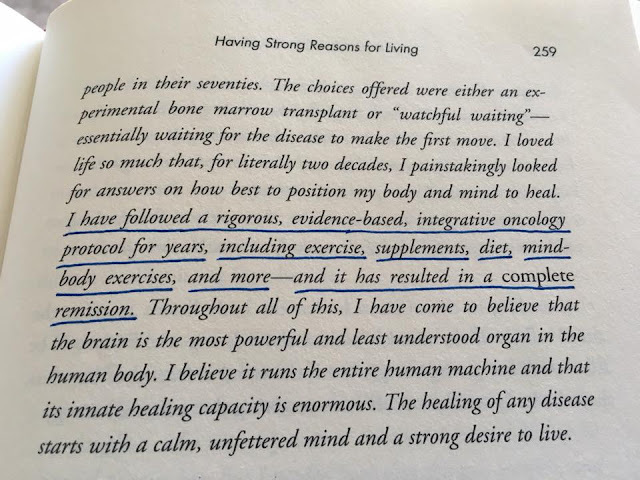 I have followed a rigorous, evidence-based, integrative oncology protocol for years, including exercise, supplements, diet, mind-body exercises, and more - and it has resulted in a complete remission. 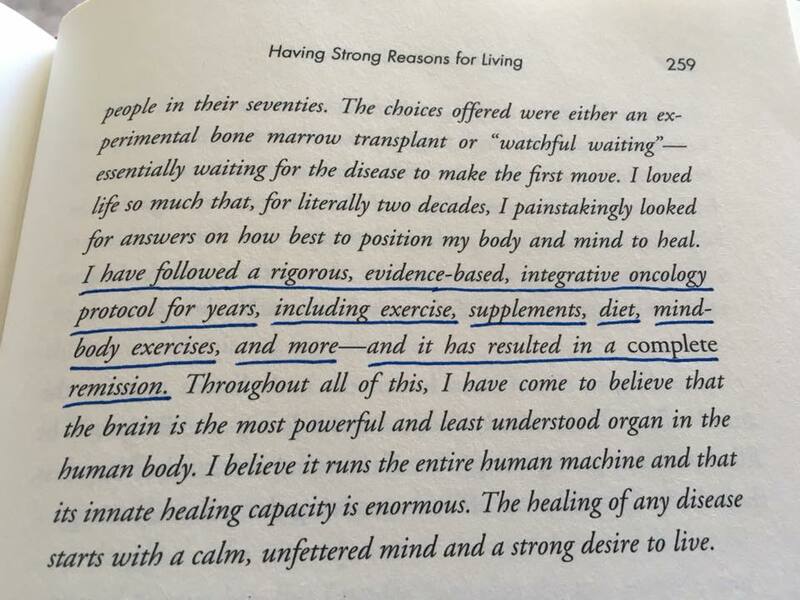 This sentence perfectly summarizes my thinking about dealing with Glioblastoma. Hope I will be able to truthfully say the same thing in my context in a few years. I am recovering well from the knee surgery 2 days ago. With the restriction of staying home and in bed most of the time, I am getting into a rhythm of regular life as normal as possible. The only physical work I have to do regularly is to drag myself on my bum from the bed to the bathroom and back. Doing well with it; nothing much to complain about there. In addition, I am able to get back to work on my computer a few hours a day. The doctors have arranged for an Optiflex K1 Knee CPM machine for helping with physical therapy while my knee is immobilized and healing from the surgery. The technician visited our home the evening of the surgery and trained us on how to use the machine. Quite simple indeed. The recommendation is that I should put my knee through the constant motion machine for six hours a day. Starting with a flex from 0 degrees to 30 degrees and possibly going up to 90 degrees flex in a couple of weeks. We tried it out for the first time yesterday and found it easy to use as well as convenient to be on it for hours. So it should not be too difficult to meet the recommended 6 hours flexing requirement per day. Since I am immobilized for a few days after the surgery, I am at a risk for blood clots from the lack of movement. I am making sure I move my toes and ankles as much as possible, and as frequently as possible. Just moving my base from the bedroom to the living room and back for no other reason than to just move around. 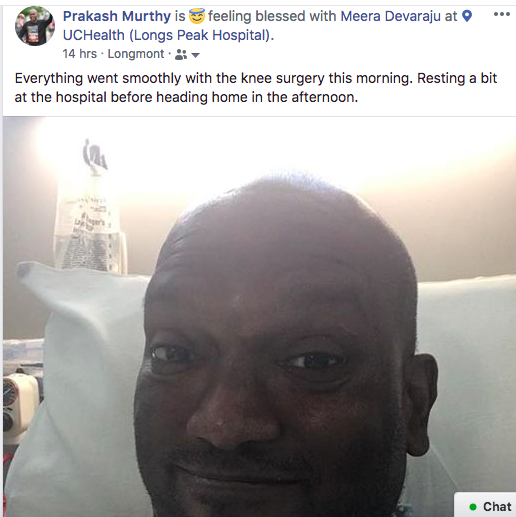 So all in all the smooth-sailing with the knee surgery continues. The brain surgery has been scheduled for Thursday, July 19th afternoon at Boulder Community Health. The wheels are turning and everything is falling into place. Hoping that it turns out to be as smooth of an experience as the knee surgery, and with no adverse side-effects whatsoever, despite the position of the tumor in close proximity to the motor cortex controlling the movement of the right side of the body. Fingers crossed - with a prayer on our lips - for a continued tide of good luck and fortune in this journey. 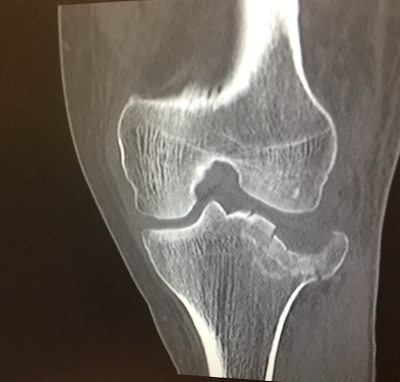 I went through with the planned knee surgery yesterday to have my broken left tibial plateau fixed. And the day was remarkable for how easily everything fell in place and how simple and easy the whole experience was. I want to write about yesterday's experience in detail as I think it is worth describing the high quality of care I got and exploring what went into making it so. The idea of a possible surgery to fix the damage was first broached on the day of the accident itself on Saturday, June 24. The CT Scans and the X-Rays showed that the damage to the left tibial plateau was severe, and required handling by experts. If it was deemed an emergency that couldn't wait, the emergency folks might have arranged for the surgery to be performed the same day. However, they referred us to contact an Orthopedic Surgeon for further advice later on as the surgery could wait. Since I was not supposed to bear weight on the broken legs, we decided to not walk up and down the two sets of stairs to our third-floor apartment, and instead take up on our ground floor neighbors/friends offer to stay at their home for a few days. While it was complicated managing with two homes, it did help us immensely to settle down while I was physically impaired to move around. 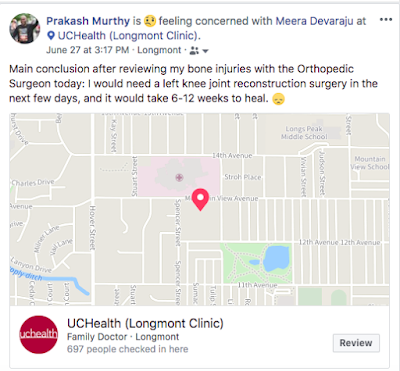 We met with Dr. Gavin Bishop - the Orthopedic Surgeon at Longmont Clinic - on the following Tuesday - June 27th, and got more details and confirmation about the need for surgery. The date for the surgery was set for a week later at this discussion. The medical staff went through all the preliminary formalities required for the surgery at this time and made sure we were ready with all the required information. 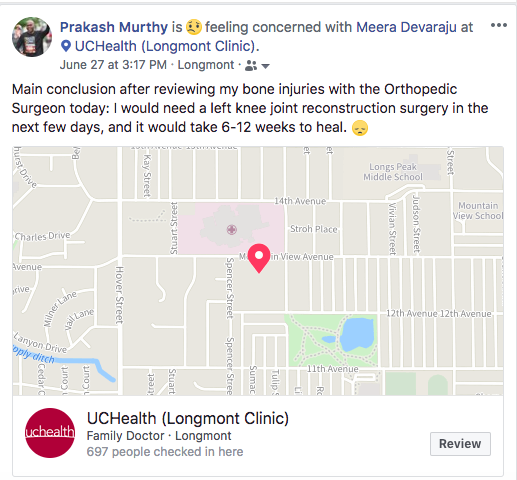 The nursing staff from the Longs Peak Hospital - who would be part of the surgery team - called up over the phone on the day before the surgery to review the surgery procedures specifically around usage of anesthesia, usage of blood transfusions, medications I was on, allergies, etc. They also made sure we know where we had to go at what time and what to expect at each stage. On the day of the surgery, my nephew Shashidhar drove me to the hospital at 6:30am for the 8:00am scheduled surgery. I was checked in to a separate preparing area for the pre-surgery preparation. I changed to a hospital gown. Used a urinal bottle to pee. Scrubbed my body completely with anti-bacterial tissues. 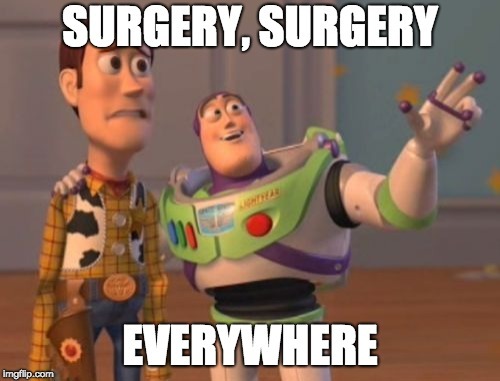 Met with the different members of the surgery team as each one came by to say Hello, and explain what they were doing, as well as ask me what I thought the procedure was for. Just as it was about to turn 8:00AM, the anesthesiologist administered a powerful anesthetic (they told me the name before, but I don't recall now). And it was like a Television blacking out on switching off the power. The nurse did tell me that I would co-operate with them when they ask me questions during the procedure or ask me to move over, etc., but would not recall any details. That was indeed the case. The next thing I remember was being fussed over by the nursing staff back at the same place where I had zoned out after the surgery was completed - around 11:00am-ish. The surgeon told us everything had gone well with the surgery, and that I would need 6-12 weeks to completely heal. 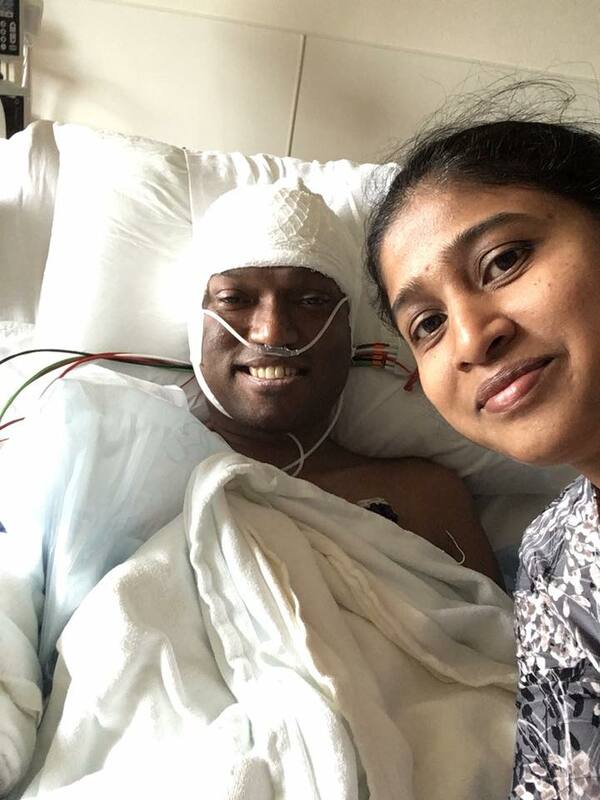 I had asked about the possibility of undergoing a brain surgery in the next 2-3 weeks. He recommended that we review the progress of healing from this surgery in two weeks and then decide on the brain surgery. Sounds like a plan. While I had not had any solid food since 10pm the previous night, I wasn't really hungry at this time. The nurse gave me two cups of apple juice and that filled me up amazingly well. We left the hospital around 1:30pm. One final problem we had to deal with was about how I was to get to our 3rd-floor apartment on bum legs. Thankfully, my wife was able to get help from two of the folks who work in our apartment complex. They along with Shashidhar - all three of them carried me step by step over the two set of stairs rather easily, and I am all set for rest and recovery from home over the next few weeks! 133 people have raised over $35K in 3 days! That took 'financial worries' off the list of things we had to worry about to provide us with a sense of financial safety during all the hospital runs over the last few days, and has made it easy on us to take on the challenging aspects of this experience with confidence. Thanks a million for everyone who made a difference for us through this fund-raiser as well as through personal favors and helpful messages. 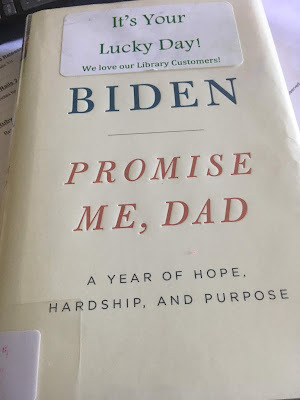 Over the last week - while I have been bed-ridden because of the injuries from the accident - I completed reading the heartfelt, authentic and moving memoir by Joe Biden - Promise Me, Dad: A Year of Hope, Hardship, and Purpose. 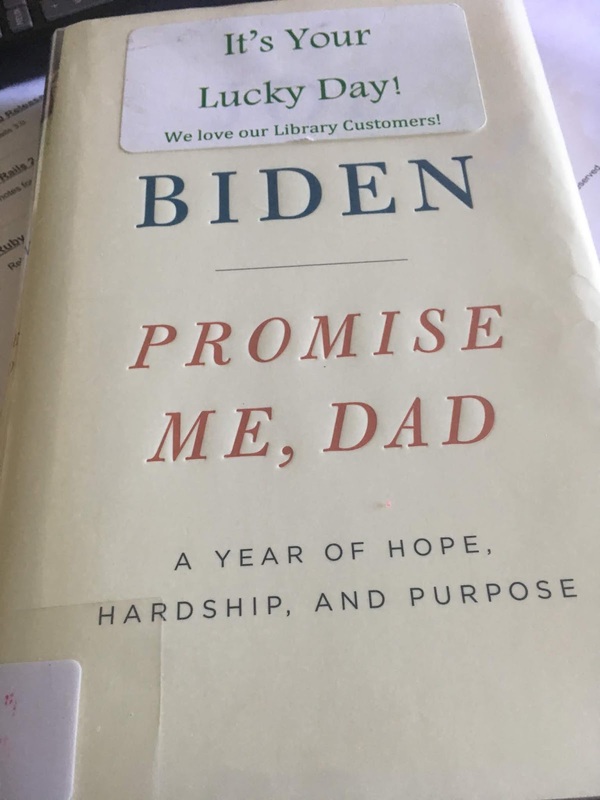 In this impactful and gripping book, Biden chronicles his son Beau Biden's journey through Glioblastoma with presidential, national, and international politics as a background. Beau Biden is one of the few high-profile victims of Glioblastoma. I think it is awe-inspiring and praise-worthy that the Biden family have left such a public record of their very private and harrowing journey with this terminal cancer. Hopefully, more such records of patient journeys will help in finding a breakthrough for curing Glioblastoma forever in the near future. From Wikipedia: In May 2010, Beau Biden was admitted to Christiana Hospital in Newark, Delaware, after complaining of a headache, numbness, and paralysis; officials stated that he had suffered a "mild stroke". Later that month, Biden was transferred to Thomas Jefferson University Hospital in Philadelphia and kept for observation for several days. From Wikipedia: In August 2013, Biden was admitted to the University of Texas MD Anderson Cancer Center in Houston and diagnosed with brain cancer, after experiencing what White House officials called "an episode of disorientation and weakness". A lesion was removed at that time. Biden had radiation and chemotherapy treatments, and cancer remained stable. 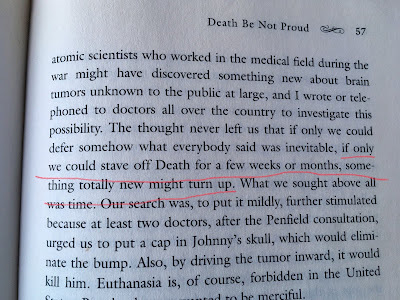 From the book (Pages 28-30): August 2013: We were drawn to M.D. Anderson by the reputation of Dr. Raymond Sawaya, a neurosurgeon who was regarded as the best in the world at a procedure called awake craniotomy. The operation allowed the surgeon to remove the greatest part of a brain tumor without doing damage to speech, cognition or motor skills. 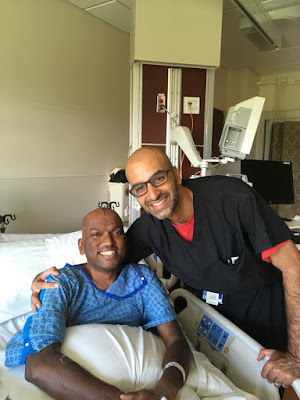 The patient was actually conscious through most of the surgery, naming simple objects drawn on flash cards or in casual conversation with the anesthesiologist, while Dr. Sawaya probed the outlines of the tumor with tiny electrodes. If Beau suddenly couldn't identify a picture of an elephant or a car, felt a loss of strength, or couldn't talk at all, Sawaya knew he could not cut in that spot without doing serious damage. Beau had to be strong enough to endure hours of this very disconcerting procedure. [....] When Dr. Sawaya got 98 percent or more of the tumor, there was a much better chance for the patient to beat the odds. Anything less made a difficult battle that much harder. [....] Dr. Sawaya was obviously pleased with how the surgery had gone. He had removed a tumor slightly larger than a golf ball, and Beau had come through without a single complication; except for the scar on the side of his head, he would be as he was before. His speech, his cognition, and his motor skills were unharmed. But the news had not all good. The Tumor was slightly diffuse, and Sawaya had not been able to get all of it. He had detected some microscopic cancer cells right against the wall of an artery, and he knew if he tried to cut them out Beau would have been left with serious and irreversible damage. Then the news got worse. Much worse. The lab results, Dr. Sawaya explained, confirmed the medical team's expectations: Beau's tumor was definitely a glioblastoma. Stage IV. From the book (Pages 16-17): November 2014. Biden Family Thanksgiving Getaway in Nantucket, MA: Beau Biden was easily fatigued and increasingly shy to interact with people. 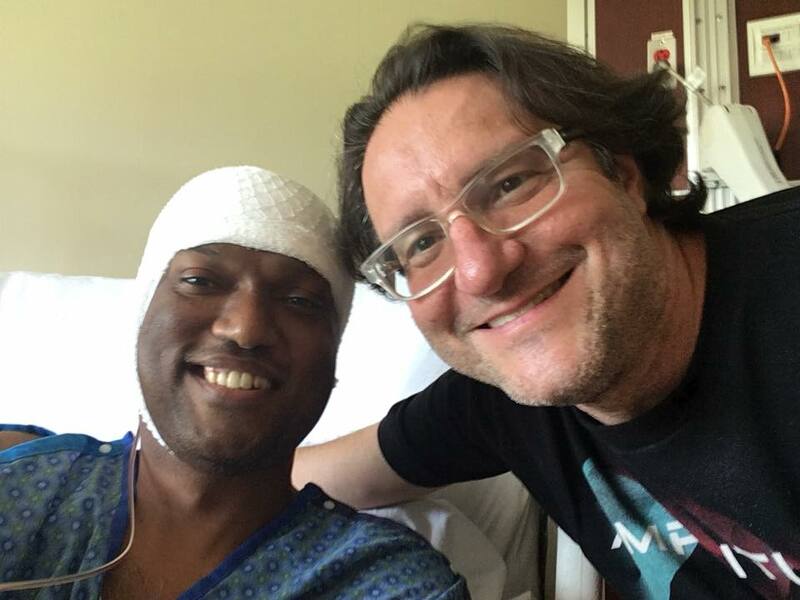 He was losing feeling in his right hand and it wasn't strong enough for a good firm handshake., and he had been wrestling with a condition called aphasia. Radiation and chemotherapy had done some damage to the part of his brain that controlled the ability to name things. Beau retained all his cognitive capabilities, but he was struggling to recall proper nouns. He was working like hell to win back his strength and to reverse the aphasia. He was going to Philadephia most days for an hour of physical therapy and occupational therapy and then an hour of speech therapy, above all and beyond his regular chemo treatments. From the book (Pages 80-81): From the very beginning, way back in the late summer of 2013, Beau had opted for the most aggressive course the oncologist could chart. When Dr. W. K Alfred Yung of M.D. 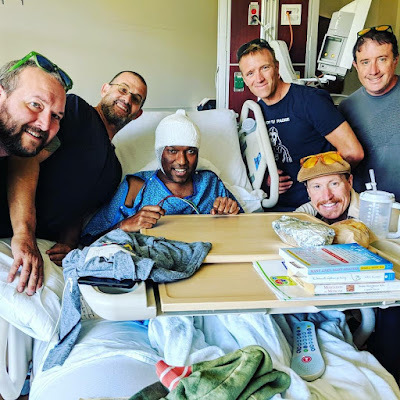 Anderson recommended that Beau endure triple the amount of standard chemo drug, called Temedor, while also taking part in the first field trial of an experimental drug treatment designed to boost the effect of Temedor, Beau said, "Let's do it." A few months later, when Dr. Yung suggested adding an unapproved but promising new drug to combat one of the mutations that made his tumor especially virulent, Beau said, "Let's do it." Dr. Yung cautioned that while there was evidence in animal studies that the drug worked, there were no human studies to back it up. There could also be uncomfortable side effects. "If there's a skin rash, "Beau said, "I'll just wear long sleeves and a baseball cap. All good." From the book (Page 82): Beau held his own all through the summer, until August 2014, exactly a year after his diagnosis, when he had a sudden loss of strength and numbness in his right arm and right leg. He didn't complain. He didn't panic. "What's next?" He asked his oncologist. "How do we fight this?" Dr. Yung suggested a more potent drug, with likely side effects including nausea, fatigue, mouth sores, and diminished appetite. The drug would also increase his risk for infection, anemia, and even more serious blood issues. "Okay, Doc," Beau said, "let's do it." From the book (Page 123): March 2015. The news [from M.D. Anderson about the new scans] could not have been worse. This was all new tumor growth. The cancer cells in Beau's brain were multiplying fast and in new places. This was the day we had been dreading from the day Dr. Sawaya removed the original tumor. [....] The doctors explained the disconcerting architecture of the new growth. 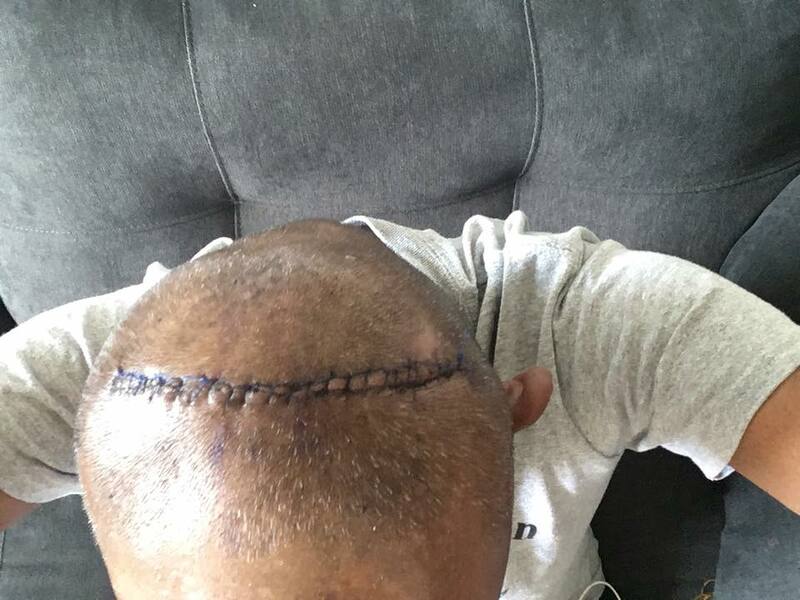 There was a large mass in front of the space where Dr. Sawaya had removed the original tumor. Sawaya was prepared to go in and remove it as soon as possible. But there was also growth well beyond the original tumor, which Dr. Sawaya could not safely remove. From the book (Pages 123-124): March 2015. ... could try the promising new experimental immunotherapy we had talked about a few months earlier. The medical team at M. D. Anderson had prepared Beau for the therapy a month earlier by drawing his blood and collecting some of his T cells - the white blood cells that identify and destroy malicious foreign agents in the body. The idea of this new immunotherapy was to identify the specific protein in the tumor cells that was triggering the growth and to engineer the patient's natural T cells to attack that specific protein only. The T cells would, in theory, gobble up the cancer cells and leave all the nearby healthy brain cells untouched. But it turned out they couldn't make that work. Beau's cancer cells had proven too diabolical; the doctors had been unable to identify and isolate the unique protein in Beau that was triggering the growth. From the book (Pages 124-125): March 2015. ... another possible treatment. [...] Dr. Sawaya would surgically remove the cancerous nodule in front and then a few days later, another specialist at Anderson would inject a specially engineered live virus into the new tumor growth in the back. The purpose of the injection was to activate Beau's own immune system and let it attack the cancer cells. They had already had extraordinary success in a few of the twenty-five patients who had received the live virus injection. Dr. Yung also explained that they also wanted to try something else in combination - a separate immunotherapy treatment designed to hypercharge the organic attack on the tumor. Beau would be the first person to ever have this combination, and the risk was enormous. There was a possibility that Beau's immune system would overreact and start eating healthy brain cells, too. 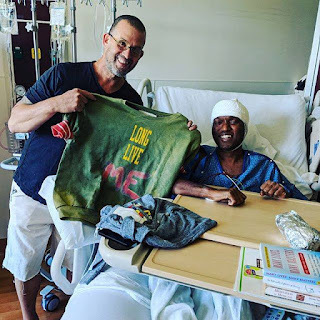 [...] The surgery would have to wait three or four weeks, the doctors explained, to allow time for the chemotherapy drugs Beau was now taking to clear his system, so he would be able to heal after another major brain surgery. The doctors decided to do the first injection of the immunotherapy - called anti-PD-1 antibody - as soon as possible. Dr. Yung wanted to do the procedure in the middle of next week, on Wednesday, March 4. From the book (Pages 141-142): March 4, 2015. ... The procedure to inject Beau with the anti-PD-1 antibody pembrolizumab - or pembro, as the doctors called it - had gone well. The procedure itself was a simple one. They put in an IV in his arm, shot about 150 milligrams of pembro into his bloodstream over the next thirty minutes, and it was done. From the book (Page 154): Beau came through the surgery on March 27 just fine, with no ill effects to his cognition or his motor skills. Dr. Sawaya had excised all he had hoped to, but the tumor appeared to be growing fast now, and Beau was weak. The medical team had decided to wait until the next Thursday, April 2, to do the injection of the live virus. That was still six days away. But Dr. Yung and Dr. Lang wanted to be sure Beau was strong enough to handle it. So all we could do now was wait. 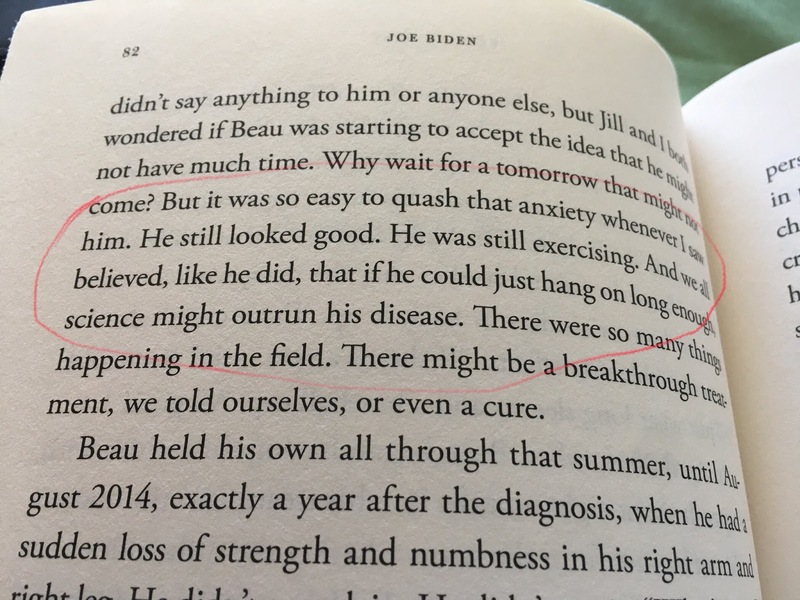 From the book (Pages 161-162): April 12, 2015 - Beau had come through the injection of the live virus ten days earlier without a single complication. He was moving well. His appetite was still good. And he was mentally sharp. 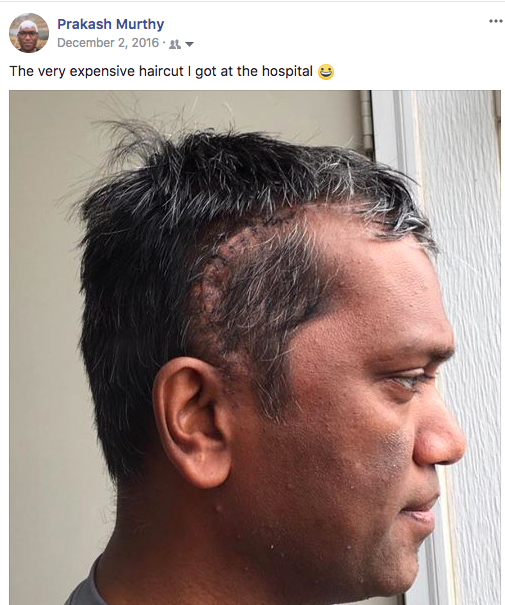 But the two fresh, angry scars on his scalp put us all on the edge; the entire family was dreading the coming effects of the untested experimental treatment. Dr.Yung and Dr. Lang had warned us that Beau would get much worse before he got better. Maybe much worse. They said he would likely be at his most vulnerable point in the third or fourth week when the virus and Beau's own immune system were at war with the tumor. The inflammation could be painful and debilitating. There would be no predicting how low he could get, or if he would survive the onslaught. The climb up from the physical nadir could take a long time, too, and we wouldn't know for sure until then if the treatment had been successful and Beau's tumor was gone. The next six or eight weeks would tell all. From the book(Page 165): April 15, 2015 - Beau went to M. D. Anderson so Dr. Yung and Dr. Lang could assess the early results of the live virus injection, and Dr. Yung could administer the second injection of pembro. The news was potentially incredible. The scans showed inflammation, but it looked like the tumor growth had really slowed. There was clear evidence of necrosis on the edge of the tumor, which meant the virus was probably already exploding the cancer cells. Beau was in good shape, not showing any ill effects from the virus, and there was already evidence of tumor destruction. From the book(Pages 165-166): April 19, 2015 - Beau was badly dehydrated and had not gotten out of bed in 3 days. So the doctors packed him off to Thomas Jefferson University Hospital in Philadelphia. This was likely the start of the first serious symptoms of the virus. Beau was still badly dehydrated when they admitted him, and his sodium levels were dangerously low. He couldn't keep his eyes open. He was barely responsive. The best he could do in response to a question was a thumbs-up, or a barely audible "Yes.". This was it now. We were in the worst of it, and unsure how long the worst would last. The effects of the virus were beginning to punish Beau. The swelling in his head was intensifying and the pain would have been excruciating, so the doctors kept him heavily sedated most of the time. From the book (Page 171): Early May 2015 - Beau held steady for ten or twelve days, and there was some evidence on the scans that the tumor might be shrinking. His appetite was still bad, so the doctors inserted a feeding tube. But in the first few days of May, he started showing a little improvement. [...] If Beau was on the upswing, we decided he should go to Walter Reed, the military facility just outside Washington, where he would be able to restart his physical, speech, and occupational therapy once he rebounded from his temporary virus-induced illness. From the book (Page 171): Beau arrived at Walter Reed on May 5, 2015 - almost immediately the feeding tube caused an infection and he was rushed to an emergency surgery to replace the feeding tube and clean out the infection. Complications piled up for the next two weeks and brought him more suffering and more pain. [...] There was fluid buildup in the left ventricle fo his brain, and every time the doctors drained it the fluid just came back, which meant he was in pain or disoriented when he was conscious. Later he had a bout of pneumonia requiring a jolt of powerful antibiotics. 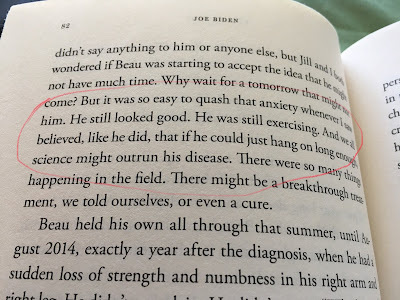 From the book (Pages 178-179): On May 17, 2015, Beau got out of bed for something approaching physical therapy. 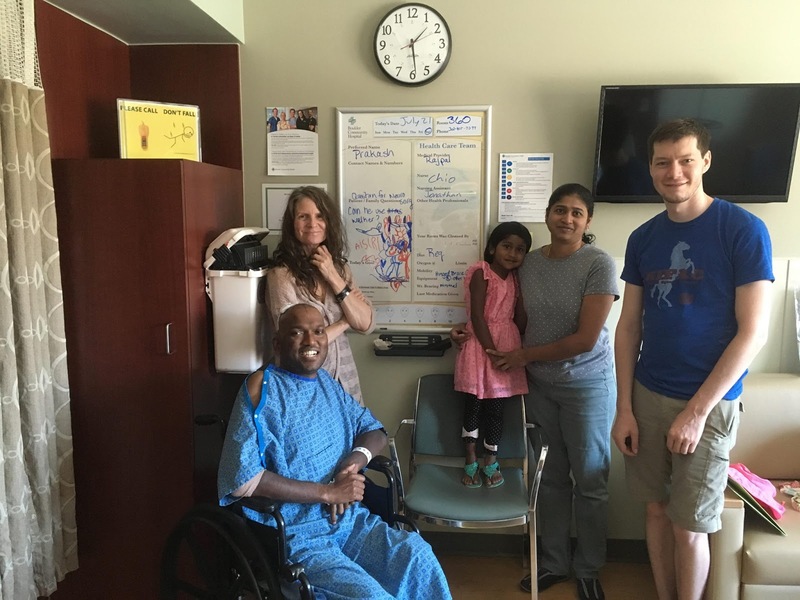 He was able to stand upright, with some help from the nurses, for five minutes. 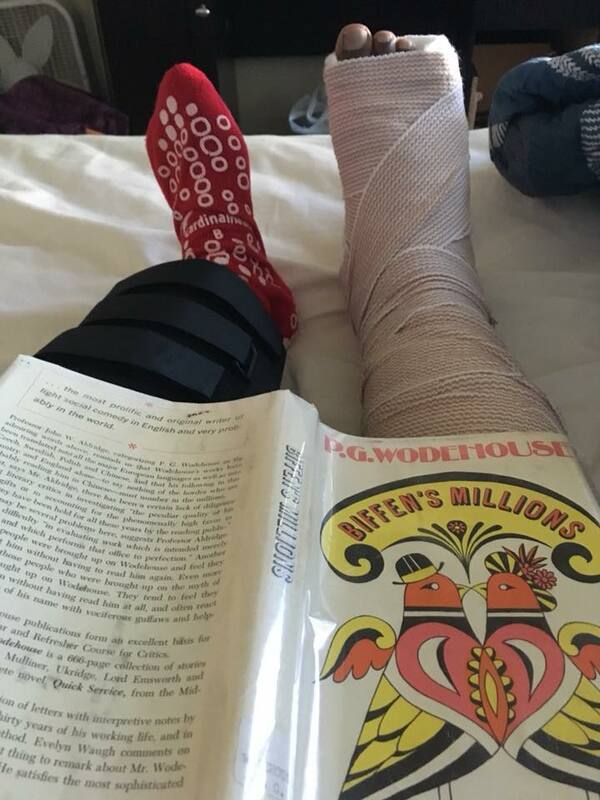 [...] The next day he was strong enough to sit up in a motorized wheelchair for a spin around the nurses' station. [...] Seven weeks after the live virus injection, it looked like Beau had finally started to climb out of the dark hole. From the book (Page 187): Beau had a bad night on Wednesday, May 29th, 2019, and by the next afternoon he was barely responsive. From the book (Page 189): The End - May 30th, 2015, 7:51 PM. It Happened, I recorded in my diary. My God, My boy. My beautiful boy. And we believed, like he did, that if he could just hang on long enough, science might outrun his disease. 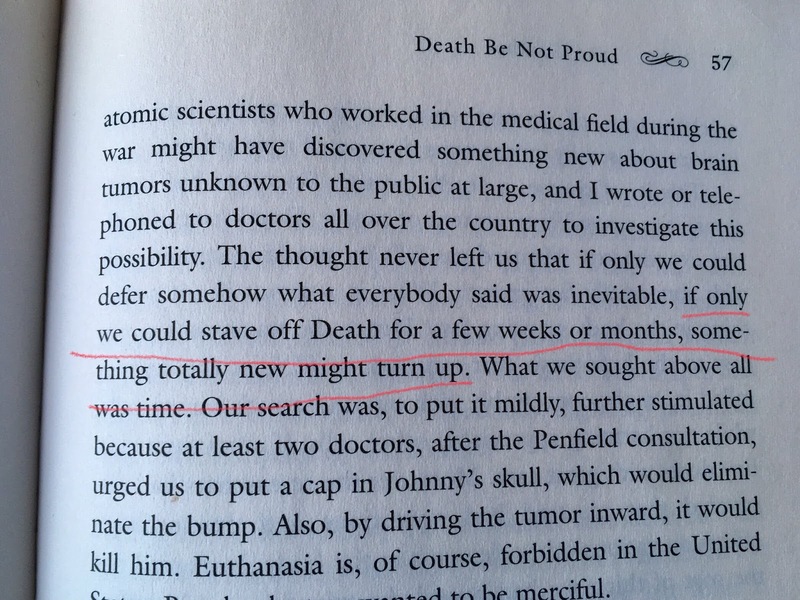 This same sentiment was expressed in John Gunther's book 'Death Be Not Proud' about his son's fight with brain cancer back in 1946 with the sentence: if only we could stave off Death for a few weeks or months, something totally new might turn up. Hopefully, the cure for Glioblastoma is really within reach and will be available to all patients very soon!